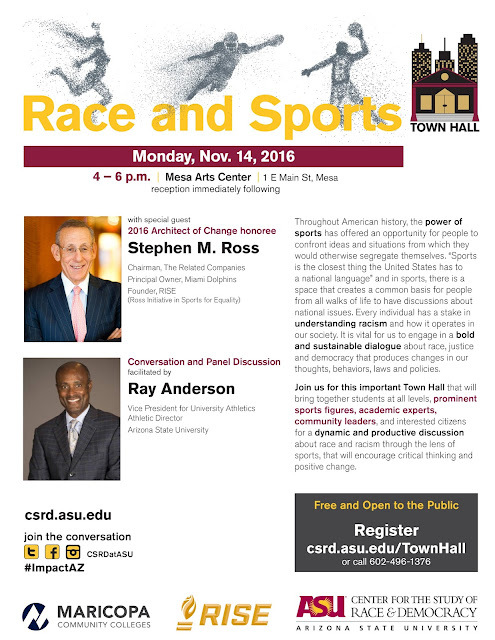 Take part in an engaging discussion about race and racism through the lens of sports with students, prominent sports figures, academic experts and community leaders during a special town hall-- Race and Sports, Monday, Nov. 14. The event will include a facilitated conversation, panel discussion and audience Q&A followed by a reception. Presented by the Maricopa Community Colleges, Ross Initiative in Sports for Equality (RISE) and Arizona State University's Center for the Study of Race & Democracy.